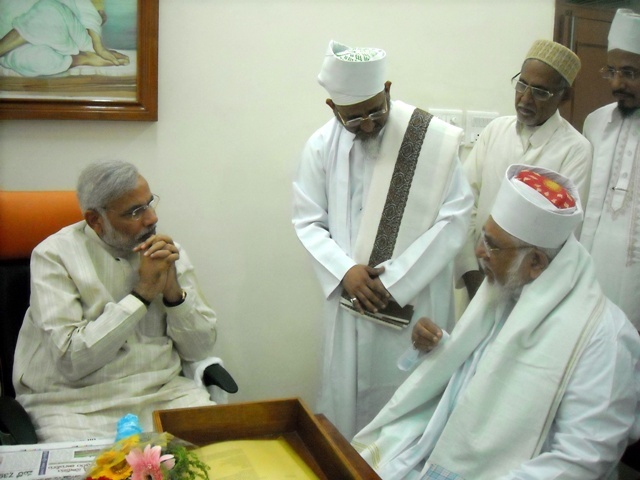 Spiritual and Political mirrors of this World reflected an extraordinary brilliance when Huzoor-e-‘Aali Saiyedna Taiyeb Ziyauddin Saheb (tus) met Narendra Modi – Hon. Chief Minister of Gujarat at Gandhinagar on 29th Safar 1430 / 24th February 2009 – Tuesday at around 1515 hrs. It was long awaited wish of Huzoor-e-‘Aali (tus) to meet the CM and greet him for his unparallel achievements in pushing the State above others in various fields. CM did the warm welcome of Huzoor-e-‘Aali (tus) and exchanged the compliments. 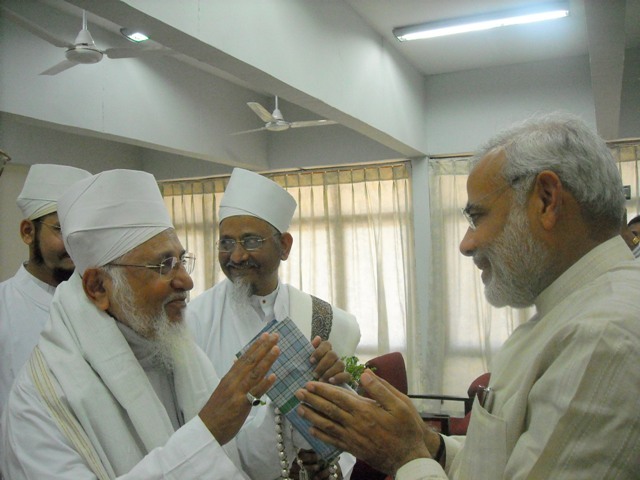 Huzoor-e-‘Aali (tus) had a healthy conversation with him as he was curious to know about the relationship of the Bohras with Gujarat. Huzoor-e-‘Aali (tus) talked at length about the ancestry of Faatemi Da’wat and its roots in the Land of Hijaaz (Saudi ‘Arabia) from where it shifted to Yemen, Misr (Egypt), Ahmedabad and finally to Vadodara – where Alavi Bohras have settled since last 320 yrs. He said that the history of Bohras dates back to the time of 18th Faatemi Imaam Maulaana Mustansir Billaah (as) (around 480 AH / 1000 AD) when he sent his representatives to India to spread the message of the religion of Islaam. People who accepted the teachings of Imaam (as) came to be known as Bohras. 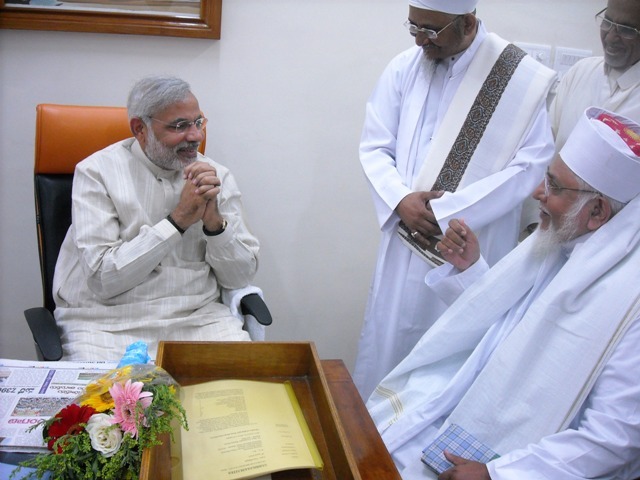 As far as the seat of Da’wat is concerned, India enjoys the unique mark of being the cradle of Da’wat-e-Adamiyah (mission of the father of mankind, Maulaana Adam (as)) on which he was born and this Da’wat will continue to flourish here in India till the Last Day. He recollected that our community had distinct status during the Gaekwad rule in Vadodara. 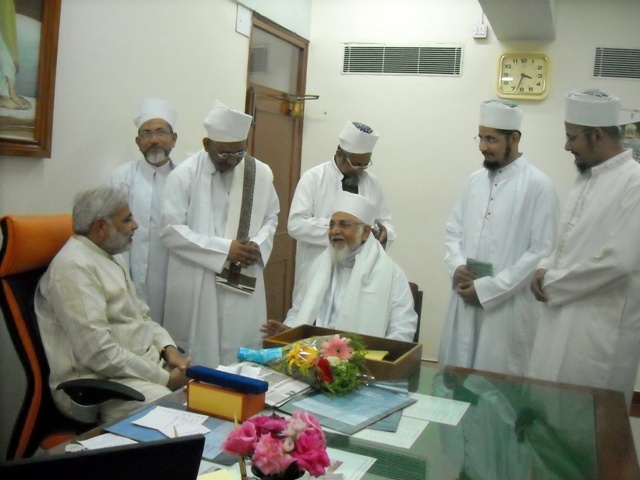 He gave a brief idea about the Alavi Bohras and said that our community people are engaged in their family business of optical industries – the iconic business of Alavi Bohras since decades. Huzoor-e-‘Aali (tus) said that, Gujarat State has experienced many political turbulences in the past but since last 5-6 years, it has witnessed high political stability which is essential for steady growth of the State, which is the fruit of dedication and efforts of the CM. Looking at the portraits of Sardar Vallabhbhai Patel and Mahatma Gandhiji above the chair of the CM, Huzoor-e-‘Aali (tus) said that, ‘You are working under the shadow of these great personalities is a matter of pride and inspiration.’ He praised about his innovative and encouraging campaign of Vibrant Gujarat. Huzoor-e-‘Aali (tus) recited a Hadees of Rasoolullaah (saws), “Ad-du’aao selaahul mumin” which means, ‘Du’a (supplication) is the only weapon of a Mumin to get peace and goodness.’ He said that, Nothing is supreme than Du’a and Blessing. Expressing respect with a smiling face, CM replied that, ‘I don’t want anything from you, but the Du’a and your Blessings which you have given me are greater than everything.’ Huzoor-e-‘Aali (tus) while concluding his conversation said to the CM, ‘May Allaah answer your wishes and fulfil all your future ambitions in uplifting the image of Gujarat as a Model State of India.’ Maazoon Saheb (dm) personally invited CM to come at the residence of Huzoor-e-‘Aali (tus) at Daar us Salaam in Vadodara. CM accepted the invitation and assured that he will plan a visit to Vadodara and have a special meeting with Huzoor-e-‘Aali (tus) at his residence.